consciousness that involves a loss of muscle control]). He was crippled by his seizures, which were terrifying for him and reappeared at intervals throughout his life. In 1846 he had to face the deaths of his father and his beloved sister. 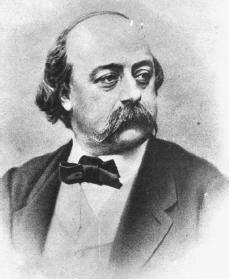 Flaubert decided to quit his legal studies, since any emotional excitement brought on an attack of his epilepsy. He felt he must become an observer of life and not a participant in it, so he devoted himself only to his writing. Flaubert had brought up the orphaned niece of his beloved sister. His niece was financially ruined in 1875, and he sacrificed his fortune in an attempt to help her. Bankrupt, unable to help her further yet worrying over both their situations, he turned to the writing of his Three Tales (1877): "A Simple Heart," "Legend of Saint Julian the Hospitaller," and "Hérodias." Bart, Benjamin F. Flaubert. Syracuse, NY: Syracuse University Press, 1967. Lottman, Herbert R. Flaubert: A Biography. Boston, MA: Little, Brown, 1989. Wall, Geoffrey. Flaubert, a Life. New York: Farrar, Straus, and Giroux, 2002. This helped me a lot with the author's life but please expand the information about the author's works.